After making Cinnamon Swirl Bread for several days in the last two weeks I decided to try my hand at Cinnamon Rolls and I've got to tell you, I LOVE the King Arthur Flour website for all things yummy in the yeast category. Their recipes are very easy to follow and so far the three I've tried have been wonderful. Of course it helps that I use a Kitchen Aid mixer and don't have to kneed by hand! Combine all of the dough ingredients in a large mixing bowl, stirring till the mixture becomes cohesive. Transfer the dough to a lightly oiled work surface, and knead it for 5 to 8 minutes, till it’s smooth. Or knead it in an electric mixer, using the dough hook, for 4 to 7 minutes at medium speed. Place the dough in a lightly oiled bowl, turn to grease all sides, cover the bowl with a proof cover or plastic wrap, and let it rise for 60 minutes, till it’s nearly doubled in bulk. I didn't take any pictures of this because it's pretty self-explanatory. After the dough has doubled in size, place a long piece of parchment on the counter, lightly flour parchment and transfer the dough to the paper, roll it into a 16 x 21-inch rectangle-ish shape. Spread the dough with the 1/3 cup butter. Mix the brown sugar and cinnamon, and sprinkle it evenly over the dough; and yes it already smells yummy. Cut the log in half, then each piece in half, and each piece into thirds to make 12 pieces. Place the 12 slices (or 13 like mine) into a lightly greased 9 x 13 inch pan. Cover with plastic wrap and a towel and place in a warm spot until doubled in size 30 - 60 minutes. Preheat oven to 400 degrees. Bake 20 - 25 minutes; you may need to tent with tin foil for the last 10 minutes. 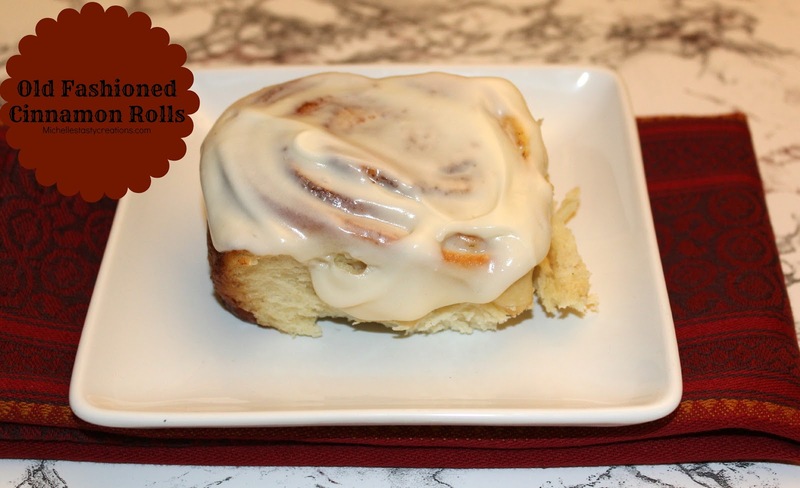 While the rolls are baking, make the icing and ice when they are still warm. Here's the yummy goodness that was created today! In case you're wondering, yes, the icing recipe does cover ALL the cinnamon rolls, but I have one that doesn't like icing (who knew such a thing could actually happen) and so I left a couple uncovered. I have now made these three times and really, they get easier to make each time.